March 28, 2017|Posted in: Crafter's Corner, Happy, Healthy, Smart Kids! 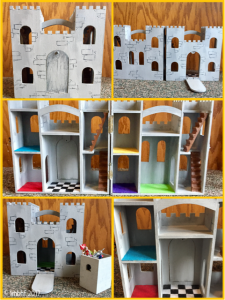 The Grands love this play castle I made for them. They play for hours with the Castle, Knights, Fairy Princesses and Dragons (who mysteriously disappeared before this photo shoot). With this fun play set and their imaginations my grandkids visit fairytale lands where amazing and magical things happen! 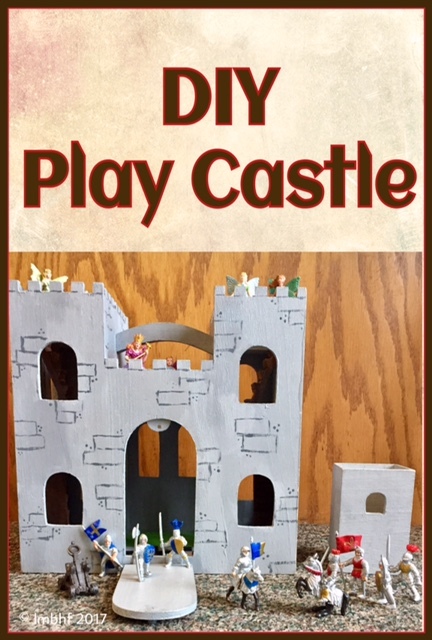 Everything you need to make your very own Castle Play Set for your little ones can be purchased at Michael’s Craft Store. They also sell Safari Toobs, (tubes full of small plastic figures) that perfectly complete your set. 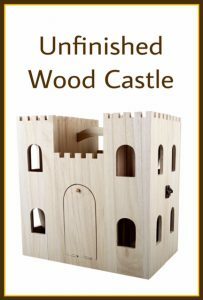 The wooden castle comes with a little wooden box that slips inside and can be used to store the figures. If you pay full price for everything this project can be a little costly. I watched for sales, used discount coupons and purchased everything over 3-4 weeks to make it more affordable. 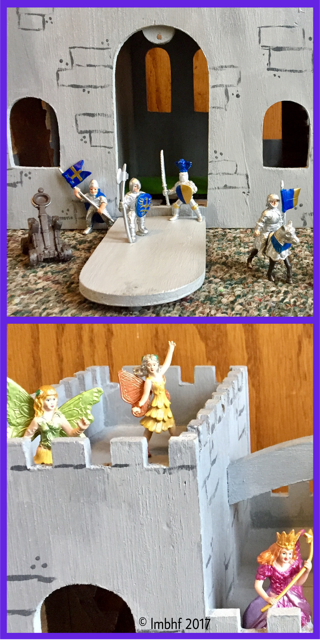 Knights and Fairy Princess Play Figures. Lay down newspaper to protect your working surface. Using a fairly large brush, paint the entire wood surface (excluding the staircases) light gray. Don’t forget to paint the storage box as well. Look over your work very carefully and use a smaller brush and light gray paint to fill in any cracks or crevices that didn’t get covered with paint in Step 2. With a small paintbrush paint the staircases brown, being careful not to get brown paint in the light gray areas. Paint sketchy rectangular shapes and tiny random dots to look like bricks in random places on the outside of the castle. When the paint is dry spray the entire castle with glitter spray to give it a shimmering silver appearance. Completely cover the castle and storage box in clear coat spray and allow to dry. Measure and cut bright pieces of felt and glue them to the floor in the rooms. (I covered one floor with smaller alternating squares of black and white for a more “royal” look). Add your chosen Safari Toob figures to. Present the Play Set to your little ones and watch as they enjoy endless hours of magical fairytale fun!! 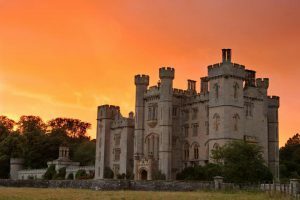 Enter this Sweepstakes to Win a Stay in a Real Castle! Looks like a fun thing for the grandbabies and an awesome trip for a family! Thank you Lori for sharing this post and co-hosting at the #BloggingGrandmothersLinkParty. I shared it on social media. Thank you for sharing at the #BloggingGrandmothersLinkParty. I have shared on social media. « April Fools Day Gags and Gifts!